IHRC is deeply concerned by the escalating violence in Yemen between the Houthi tribe and government forces. The conflict is becoming increasingly brutal, with hundreds of civilians killed and 35,000 people displaced in the past two weeks alone. Civilians are unable to leave the North of Yemen and are trapped by the fighting, whilst aid agencies are also prevented from providing urgently needed relief. Disturbing reports allege that Saudi forces are using phosphorus bombs in the border region between Yemen and Saudi Arabia. Phosphorus bombs are banned by international law when used in civilian populated areas. Since August of this year increasing violence has impacted the civilian population with hundreds of deaths and 150,000 displaced people. The displaced persons are trapped in the North of Yemen where there is currently a media blackout, therefore figures and reports of casualties and events cannot be independently verified. Saudi officials claim to have captured hundreds of Houthi fighters while Houthi fighters also claim to have captured Saudi soldiers. Pictures from a Turkish News website show horrific injuries on corpses allegedly caused by phosphorus bombs used by Saudi forces on the border areas but within Yemeni territory. Saudi officials deny the use of phosphorus bombs and claim that they were simply flares. Pictures can be accessed via this link: https://www.ihrc.org.uk/gallery/view/23. The images are of children and civilians who have been gruesomely ravaged by weapons used by Yemeni and Saudi forces. 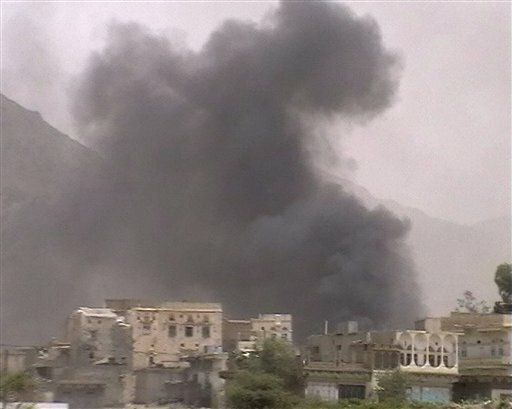 Sectarian violence in Yemen has a five year history. The Houthi tribe want independence from the government of Yemen due to discrimination and social inequality. The deteriorating economic situation in Yemen further causes civil unrest with predictions of Yemen becoming a failed state. The majority of the Yemeni population live under the poverty line causing significant frustration and unrest especially towards the government. The dictatorship rule of Ali Abdullah Saleh has been in place for 31 years, making it one of the longest running leaderships. This dictatorship has embraced the US anti terror strategy and since then has had a deteriorating human rights record. According to a 2008 report published by Human Rights Watch (http://www.hrw.org/en/node/75606/section/1), arbitrary arrest and disappearances have been common from amongst the Houthi tribe. Hundreds of individuals have disappeared and there are over 1000 political prisoners. Write to the following authorities requesting them to investigate and address the unfolding humanitarian disaster in the North of Yemen, as well as forming a political solution to the conflict. a) Minister of foreign affairs in your country. UK campaigners will find the appropriate address, fax and email on the sample letter below. b) League of Arab States. You can find the address on the sample letter below. I am deeply concerned about the violent conflict in Yemen where hundreds of civilians have lost their lives and 150,000 people have been made homeless and are living in camps. Many of the displaced people are still in danger because they aren’t able to leave the conflict area nor are aid agencies able to come in because of the violence. Another disturbing element to this brutal conflict is the alleged use of phosphorus bombs by Saudi forces in civilian areas. Pictures from a Turkish news website show horrific injuries sustained from these inhumane weapons (https://www.ihrc.org.uk/gallery/view/23). This is a reminder of the Israeli aggression in Gaza when they also used phosphorus bombs on the civilian population. As well as sectarian causes, this conflict also has economical roots. Yemen is predicted to become a failed state and the majority of its people are living under the poverty line. Therefore the general Yemeni society as a whole is not content and inevitably the minorities within the society will suffer significantly more from social inequality and discrimination during these difficult economic times. I urge you to address these extremely important issues with your Yemeni counterpart to prevent further bloodshed and instability. It is your responsibility to come together and negotiate a political solution for this bloody conflict where the majority of victims are innocent women, children and men. As the leaders of the Muslim world, you must put the interests and security of your people above personal and state interests; otherwise you will lose all support and credibility amongst the Muslim population and subsequently the international states. I look forward to hearing back from you regarding these urgent matters. I urge your government to cease all violence, provide aid to the injured and displaced as well as treat all prisoners humanely.